Four years into the construction of a controversial underground water filtration plant in the Bronx, a steep rise in projected costs has revived questions about whether the city made the best financial decision in choosing the location over an aboveground site in Westchester. The city's economic crisis has made these questions more pressing than ever, adding to the concern over the amount of debt the city has taken on for capital projects and the future cost of paying the interest on that debt. The escalating cost of the facility, which will be one of the largest water filtration plants in the world, is one of a number of complaints raised by critics, who opposed ever placing it in the Bronx and say the city is mismanaging the project. As they watch over the construction of the plant as well as associated work at nearby Jerome Park Reservoir, they want to ensure that the city keeps its promises to provide jobs to local residents, minimize the environmental impacts of construction in residential neighborhoods and spend an additional $240 million on Bronx parks. Local politicians and state officials agreed to let the city build the filtration plant after the Bloomberg administration made these promises. Other projects throughout the city -- from Willets Point to Atlantic Yards to Yankee Stadium -- also faced local opposition and entail similarly elaborate agreements for community improvements, affordable housing and more. The ongoing saga of the filtration plant in the north Bronx shows the need for constant vigilance by residents and elected officials to make sure these promises are kept. The plant's roots go back to the late 1990s. The federal government has deemed much of the city's water so pristine that it need not undergo filtration. Since 1998, though, the city has been under a court order to begin filtering the portion of its water supply that originates in the Croton watershed, east of the Hudson River, so that it can meet federal drinking water standards. For nearly two decades, residents and elected officials in the northern Bronx fought the city's attempts to build a water filtration plant there. They succeeded in blocking the first proposed location at the Jerome Park Reservoir. Van Cortlandt Park is number 2 on the map above. Many pushed for the plant to be built outside of the city, at a non-residential site in Westchester County. The New York City Department of Environmental Protection, which manages the city's water supply, preferred the Bronx site because of its proximity to existing water tunnels as well as for various engineering issues. It also wanted to keep the filtration plant within the city borders for security reasons. City construction unions lobbied heavily to put the plant in the Bronx. In 2003, the city won the necessary approval from the state legislature to build an underground facility on 28 acres of Van Cortlandt Park beneath the driving range of the park's Mosholu Golf Course. In return, the Bloomberg administration agreed to spend $200 million to restore and build parks in every Bronx assembly district plus $40 million on improvements in Van Cortlandt Park. It promised that environmental impacts would be mitigated and jobs would go to local residents. The final environmental impact statement determined that building the plant in a 10-story-deep hole blasted from the bedrock, and then restoring the surface, would cost less than building at the more distant above-ground site in Westchester. Plant opponents argue that it defies basic common sense to think that building a one-of-kind underground facility would be less expensive than a standard plant above ground. They say that the environmental agency deliberately understated the costs of building in Van Cortlandt Park to convince people it was the best location. Since 2003, the projected cost of building the Croton Water Filtration Plant, as the project is called, and the associated off-site infrastructure has risen from $1.3 billion to more than $3 billion. It has been plagued by delays as well. Originally set for completion in 2006, the city now expects it to come on line in 2012. The delays have already cost the city money. The federal government fined New York City $4.78 million after it missed a 2007 deadline for hiring a primary contractor for the plant. Financing for the city Department of Environmental Protection, including debt service on large capital projects like the filtration plant, comes from water and sewer fees, not general city revenues. The department says that two recent increases in city water rates are not related to rising costs at the filtration plant. Whether or not that is true, ultimately city residents and businesses will bear the additional costs. "The costs have turned out to be what we feared -- enormous -- and the water rate payers are the ones who pay," said Assemblymember Jeffrey Dinowitz, who represents the area and is an outspoken critic of the plant. In April 2008, New York City Comptroller William Thompson began an audit of the project, which is still in progress, according to press officer Laura Rivera. The city Independent Budget Office analyzed the costs in an October 2008 report. "We tried to look at how much of it is due to general construction cost escalation, sometimes known as inflation, and our sense is that explains about 45 percent of the increase," budget office deputy director George Sweeting said, according to the Riverdale Press. He added that it would be fair to assume that the plant's costs would have ballooned wherever the plant was built. He cautioned that the analysis is not an audit. "A number of factors, including general inflation in the construction industry and the highly competitive construction market in New York City, contributed to the rise in construction costs for the Croton plant," Angel RomĂˇn, deputy press secretary for the Department of Environmental Protection, wrote in an email message. Design changes and the withdrawal of the original contractor further added to the cost. The report from the budget office shows that more than $600 million in projected costs were not included in the 2003 final supplemental environmental impact statement. These costs were not included in the estimates for either location, said budget office analyst Ana Champeny. Certainly major cost overruns are not unusual. Last week Thompson issued a report indicating that the cost of capital projects, which are funded primarily with debt, has escalated by 187 percent since fiscal year 1990. Requests by Dinowitz and other Bronx officials for a full city, state or federal investigation of the construction costs and potential conflicts of interest in the decision to site the plant have gone unanswered. One possible conflict, according to plant critics, involves Christopher Ward, who was commissioner of the city Department of Environmental Protection at the time of the plant's approval and now chairs the Port Authority. "We know that the main advocacy group for building in Van Cortlandt Park was the General Contractors Association. We also know that on the day the City Council gave final approval for the plan, Ward resigned, and almost a year later took the top job at the General Contractors Association," Dinowitz said. His year wait, Dinowitz charges, fulfilled the letter but not the spirit of city conflict of interest laws. Aside from the costs in dollars, an undertaking of this magnitude carries a number of environmental costs, bringing significant noise, dust, vehicular exhaust and other possible hazards. "The project requires enough concrete to build a sidewalk from New York to Miami and enough pipe to reach the top of the Empire State Building 140 times over. Workers carved out enough dirt from the ground to fill more than 100,000 dump trucks," Roman wrote in an email. The project's environmental impact statement called for minimizing the effects of such a mammoth effort on the adjacent community, home to about 26,000 people in a half-mile radius. Residents say that construction crews successfully muffled the noise of blasting to prepare the underground site, but it took several years before the Department of Environmental Protection was able to get pollution controls installed on construction vehicles at the site, as promised. The Croton Facility Monitoring Committee, which includes representatives of local community boards, elected officials and the parks and environment departments, was established to provide oversight of construction. Lyn Pyle, who lives across the street and was on the monitoring committee during the first year of construction, said the environment department was unable to do anything to reduce pollution from the parade of trucks going back and forth through the neighborhood. The situation improved after the city passed a law in 2007 requiring trucks to have the best available pollution controls. Residents say that, with prodding from community representatives on the monitoring committee, the Department of Environmental Protection has become more sensitive to the neighborhoods' concerns. The process at Van Cortlandt Park is much better than the one at Yankee Stadium, which does not have a mechanism for community oversight, said Karen Argenti, a former Bronx resident who has remained involved in both issues. Nevertheless, there remains a legacy of mistrust of the city. It was reinforced last summer when the environment department announced that it would use explosives to dig a shaft at Jerome Park Reservoir, across the street from the Bronx High School of Science. A judge blocked the blasting, and the agency ultimately decided to use surface drilling instead. Longtime watchdogs also are concerned about the leakage of large amounts of groundwater at the underground construction site, which they said is enormously wasteful. The project has a permit to discard up to 1.2 million gallons of groundwater and stormwater runoff a day into the city's sewage system during construction. The design for restoring the surface includes creating artificial wetlands to filter and hold runoff as well as any remaining groundwater flows. “We anticipate that the final design will incorporate several beneficial reuse and management strategies,” RomĂˇn wrote in an email. As with many projects, the city sold the filtration plant on the promise of jobs for local (typically minority) residents. Very few of the jobs have materialized, however. At the Croton plant, federal restrictions against hiring people based on where they live hampered such efforts. The lack of a labor agreement with the contractor to set aside apprenticeships for non-union members has also hindered job creation efforts. In addition, many young Bronx residents don't have the high school degree or training to gain entry to the various construction unions that control the jobs, said Gregory Faulkner, who has been deeply involved in this issue as chair of Bronx Community Board 7 and the monitoring committee. In seeking subcontracting jobs, minority businesses, which tend to be small, face obstacles such as the prohibitive cost of insurance, the lack of political connections and a demanding certification process. "It is very troubling when you have a community that needs jobs and you see billions of dollars being spent and they don't go to the community," said Faulkner. He said, however, that the Department of Environmental Conservation and Skanska, the contractor constructing the plant, are making improvements. Several programs show promise, he said. Skanska has trained two classes of local contractors in a program it created, and the environment department provided funding to Project H.I.R.E., a construction skills training program of Bronx Community College, which has trained 60 neighborhood residents so far. The environment department reported to the monitoring committee that Bronx residents held 23 percent of the filtration plant jobs in the last month. Faulkner said that percentage is greater than several years ago, but the agency's goal of 25 percent is too low. "I'd like it at 80 percent," he said. The parks department does not have figures on how many local workers or contractors have been hired to build or renovate Bronx parks. "Our contractors have employed Bronx residents for the Croton park projects and we encourage them to continue to do so whenever possible," parks spokesperson Jesslyn Moser wrote in an email. "Parks seeks the lowest bidders for our park construction projects. Unfortunately, some of the Bronx based subcontractors are not the lowest responsive bidders to our projects so they are not hired." When the water plant was approved, many people expressed skepticism that the $240 million for fixing up Bronx parks would really come through. Much of it has, though. So far, the city has spent $120 million to complete 23 of the 67 promised park projects, according to Parks Commissioner Adrian Benepe. Another 20 are under construction and the rest are in the pipeline. Asked if the current economic crisis might affect the funding, he said, "I think it's highly unlikely these things will be cut." "I think the real story here is how much good has been accomplished for the citizens of the Bronx in addition to the public good created by the filtration plant," Benepe said. Even critics agree. The parks are "the one positive that's come out of this project," said Dinowitz. But he and many residents say that it was too high a price to pay. "The Bronx should not have to accept such an awful project in its midst to get money for parks," he said. The newly renovated Sachkerah Woods Playground. The $2.3 million Sachkerah Woods Playground adjacent to the filtration plant site was one of the first projects. It was designed with a great deal of community involvement, and residents are very happy with it, said Ora Holloway, a 32-year resident who led a long community effort to rid that corner of the park of drugs and prostitution and build a playground. Restoring the golf course has proved more controversial. Many people predicted that security concerns would prompt the city to restrict public use in the area over the plant. But plans are moving forward for a new driving range, golf clubhouse and parking lot on top of the plant. These plans, however, have drawn some opposition. At a recent presentation of the design, residents were dismayed to find that the clubhouse and a 75-car parking lot encroached upon a grassy field next to the new playground, a space where families picnic and young people play pick-up sports. "In the summertime, that area is so full it is unbelievable," said Holloway. Barry McLoughlin, executive director of the Mosholu Golf Course, which is run by the nonprofit youth development program The First Tee, said, though, that the city had agreed to restore the parking once the plant was complete and that the spaces are needed to accommodate golfers and school buses and provide revenue for the program. After objections from residents, the city's Design Commission gave preliminary approval to the project on the condition that the agencies restudy the parking lot design. Benepe said that the parking lot has since been moved. The final design is expected to be released in a few months. Although the city seems to be fulfilling its promises on improving parks, the placement of the filtration plant in the park remains troubling to advocates, who say that city infrastructure doesn't belong in parks, unless there is no alternative. The project, they say, set a disturbing precedent for taking over, or "alienating," parkland for a non-park use over the objections of elected officials who represent the community. In effect, this deprives the community of a say in what happens in their park. To add to advocates' concerns, the filtration plant decision was soon followed by the taking of Macombs Dam Park for a new Yankee Stadium before the community had a chance to protest. "Parkland is an easy mark," said Dinowitz. "No one lives there. The city both under this and the previous administration treats parkland as prime real estate and that should never be." Benepe noted, however, that numerous city parks, including Central Park, have city infrastructure. Because of the mitigation money, he said, "parks in the Bronx are replete with hundreds of acres of recreational facilities that are being dramatically improved. That has never happened before with any public facility put into a park." Yankee Stadium presents a more troubling picture. As of last spring, the cost of replacing the parkland the Yankees took over for their new stadium had almost doubled, and many of the new parks, set to open along with the new stadium this spring, had fallen two years behind schedule. Residents say that the new parks are not a fair trade because they are much farther from where people live than the old facilities were, and part of the replacement is artificial turf on top of a parking garage. The Yankees say they are fulfilling promises to provide jobs for minorities and woman, construction contracts to Bronx businesses and a job-training program made in a Community Benefits Agreement with Bronx officials. So far, though, there has been no independent oversight to verify this. In addition, the team was supposed to set aside money -- about $1.2 million a year -- for local nonprofit groups, but it took more than two years before the first grants were distributed. The recent parkland takings have led park advocates to seek greater protection for public land. The nonprofit advocacy group New Yorkers for Parks is exploring legislation that requires the city to complete an environmental review before parkland can be taken. "Outcomes are important - you can't delay projects forever," said Christian DiPalermo, the organization's executive director. "But the more people are heard, the better your development or your change of use is going to be accepted in the long run." Mayor Mike Bloomberg's preliminary budget for fiscal year 2003 is an unusual - and shaky - combination of cuts, new debts, and pleas for state and federal aid. It is refreshingly transparent in identifying the depth of the city's budget deficit for next year, $4.8 billion. But with the exception of dozens of specific cuts in health, education, library, cultural affairs and other services, the budget proposal is largely an ambitious wish list: $1.5 billion from borrowing (usually a no-no), $800 million in new federal and state funding, and $600 million in concessions from labor unions. On the city revenue side, the mayor has backtracked a bit on his pledge not to increase tax revenues by proposing a $1.42 cent per pack increase in cigarette tax, worth $249 million if the state legislature approves. He has also added $260 million in increases in various fees, fines, and charges. But the lack of a more substantial revenue plan underscores the instability of his plan. While a budget ideally offers a set of priorities rather than just numbers, this one presents no vision about re-building, economic development, or human capital development. And, while the mayor has asked for sacrifice from all New Yorkers, it turns out the sacrifices spelled out in his budget narrowly target New York's most vulnerable. Mayor Bloomberg worries eloquently about the budget consequences of September 11, but he sees the deficit as mostly a one-year project, overlooking underlying budget and policy problems that have existed for years. He graciously overlooks the elephant in the room, but he is in some danger of following in his tracks. Perhaps one-quarter of the deficit is related to September 11. The rest was caused by Rudy Giuliani. It was Giuliani who reduced tax revenues by $2.1 billion a year for tax cuts, and used an average of $2.5 billion a year in budget surpluses for one-shot gap-fillers in each of the last five years. The sacrifice in program cuts is borne almost exclusively by those with the greatest needs, such as school children, seniors, youth services, libraries, cultural institutions, and local housing programs. Among the most disturbing cuts: The public schools are cut by $358 million (seven percent), seniors by $26 million (16 percent, including the cancellation of weekend meals! ), the libraries by $39 million (15 percent), cultural institutions by $19 million (15 percent), day care by $80 million (10,000 to 12,000 slots). The city's housing agency drops several anti-eviction and other housing-preservation programs. Parks lose another 80 workers and are expected to sell corporate "naming rights" to parks to raise $2 million. The mayor rather bravely looks for savings from the police department, although the 1,600 officers who will be "cut" are actually individuals who will now not be hired. (There will, in fact, be a few more officers on the force next year than this year.) By hiring 800 civilians to replace uniformed officers doing civilian work - an excellent reform - this plan will save $44 million. Another plan for the uniformed services, the Sanitation Department, is a proposed 18-month suspension of metal, glass, and plastic recycling. This would save $51 million next year. But over time the recycling program has become more cost effective, while the cost of waste export has jumped dramatically. The $1.9 billion in "cuts" includes a lot of different actions. Many of them are revenue gap-fillers, substituting federal or state funds for city funds. Others savings come from attrition, as in the Department of Corrections, where fewer prisoners means 511 fewer officers are necessary, saving $20 million. Other savings come from lower estimates of such services as foster care ($7 million) and federal reimbursement of foster care expenses ($13 million). Some $400 million is to be saved by refinancing existing bonds. But there is some concern that the way these bonds are structured may mean higher costs in the long run. What is striking about the cuts to human services is that they look so similar to Rudy Giuliani's annual ritual of cutting services close to the heart of City Council members. Most observers thought the former mayor used the exercise to keep the council busy with a relatively small part of the budget, so that the mayor could have his way with the rest of it. These program cuts do not represent a lot of money, except to those affected. Perhaps old budget habits, or old politics, die hard. The federal and state portions of the budget is a $2.1 billion wish list, $1.3 billion of it on the state side, from which the preliminary budget assumes $800 million can be realized. The state list includes the cigarette tax proposal (the state wants its own $1.50 tax), tort reform ($100 million, but a lost cause over the years), refinancing of pension liabilities ($286 million), and a restoration of state budget cuts to the city ($215 million). There is no plea, however, for the restoration of the city's commuter tax, the loss of which costs the city $500 million a year. The federal wish list includes debt finance reform ($150 million), flexible use of the hazard mitigation grant program ($150 million), a fair share of Homeland Security Funds ($200 million), and a three percent increase in the federal share of Medicaid ($146 million). At first glance, few of these proposals look very realistic. The plan includes no layoffs of city employees, but the city will negotiate with the municipal unions on fringe benefits and incentive severance programs. With many contracts about to run out and others still unresolved, there is no telling how realistic this $600 million assumption of savings is at this point. The state authorized the city on September 13 to raise as much as $2.5 billion from Transitional Finance Authority bonds to deal with the costs associated with the World Trade Center disaster. The city could use the money as a short-term cash flow vehicle, while waiting for federal reimbursement, or it can choose to use the money for city expenses and capitalize repayment over 20 years. 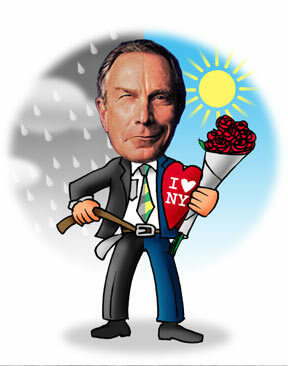 Mayor Bloomberg wants to use the money in the latter way, using $1.5 billion to balance next year's budget. His reasoning is that September was a unique event, justifying the otherwise unlikely choice. The Independent Budget Office has estimated that repayment would cost about $100 million a year for 20 years. That seems a high price to pay, a sacrifice by a generation of city taxpayers - especially with no substantial revenue budget in place. The re-financing and September 11 debt financing alone add up to $1.9 billion in one-shot gap fillings. Then there are the fragile assumptions about state and federal aid. These one-time solutions and soft assumptions look worse in the context of the four-year plan, which shows the city's plight is not a one-year problem. In fact the city is facing $5 billion and $5.4 billion deficits in fiscal years 2004 and 2005, respectively. But this is a preliminary budget, perhaps more preliminary than most. With a richer revenue budget - one that asks for a little sacrifice at the top rather than a lot at the bottom - the executive budget in April may look more solid and more equitable. Keeping the weekend meals for seniors is a good place to start. Check out the Feature Archives!